The “Hair” experience had made Marian aware of the opportunity for selling fabrics to costume designers, so she searched out possible avenues whilst in Los Angeles showing her wall pieces. Of course, with Hollywood and several major TV studios nearby, it wasn't too hard to find some interest. In fact she soon developed close relationships with several costume designers, the most famous being Bob Mackie and Rudi Gernreich. By now Marian's fabrics had become a lot more varied in design than the vivid silks of the “Hair” days, so that soon she was being approached by major fashion designers, such as Mary McFadden and Giorgio di Sant'Angelo . This made her envision a new expansion for her endeavors in the world of art. Although she had assisted her mother and aunt in making inexpensive dresses during the shortages of World War II over 30 years earlier, Marian had no training and essentially no skills in dressmaking. Therefore she had to find skilled assistance. Fortunately this didn't prove too difficult as there were a number of dressmakers in the neighborhood working from their homes. And so, using commercially available patterns, Marian started on her journey down the road of fashion. Initially garments became a sideline to her textile business. However, Marian had already decided she wanted to take it beyond the artwear scene and it wasn't long before she realized that the existing galleries and sales agents were not going to be ideal for expanding a fashion business. So it became necessary to find representatives first on the West Coast and then in New York. By the early 1980s she was also participating in the Fashion Coterie and other events for smaller designers which were held 2 or 3 times a year at major hotels in New York. And soon she had retail customers across the USA and Canada. As mentioned earlier she had been selling her garments through the artwear retailer “Obiko” in San Francisco. The consequential inclusion in the Obiko Boutique at prestigious Bergdorf Goodman in New York added a new dimension to her exposure, as it provided validity to her unique designs when dealing with less confident provincial retailers. As an adjunct to selling to Obiko, Marian also developed lifelong friendships with the other artist-craftsmen who provided artwear to the boutique. In fact they created an informal organization called Group Nine which still exists - as do the friendships. In 2013 two members of the group, Ana Lisa Hedstrom and Jean Cacicedo Leach, put together a collection of images and film from the Obiko years, and this now resides in the archives of the De Young Museum in San Francisco, where it can be viewed on request. Although Marian probably didn't have a crystal clear vision about where she was heading, she admired the works of Mario Fortuny and Madeleine Vionnet, and this gave her the confidence to believe that it would be possible to combine art with high fashion. Early designs were built around her resist dyed fabrics, mostly silk. Not just the vivid colors of the early 1970's, but also a range of muted tones more suitable for daywear. In the early 1980s she also became interested in printed fabrics and working with a local printer in San Francisco developed some unique designs that were instrumental in expanding her product line. One design has an interesting story to it. Marian acquired an old restaurant sandwich toaster, into which a prepared sandwich was placed and the toaster created a wavy pattern on both sides. Using it as tool she burned patterns onto paper to be used by the printer for setting up the print screens, and the result became her famous “toaster print”. By the mid 1980s her cottage industry was thriving. However her dye studio, which now also contained sewing machines, a cutting table and one full time employee, was becoming far too cramped. The decision was made to rent space for garment design and manufacturing, and add key people to manage the operation. Neither the business nor the family had the financial resources to make this happen efficiently. So a business plan and a budget were prepared and presented to the bank. To put it politely this type of business clearly was not something with which the bank was familiar, and borrowing proved unsuccessful. Next idea was to look for a partner with financial resources who could invest in the business. An old friend, Susan Jackson, heard about the plan and offered to invest $150,000 to get the business into the next phase. And so in 1985 the garment activity moved out of the house and into basic business space in the town of Los Gatos, while the dyeing remained in the studio at home. For the next few years the business grew in a small 2-room commercial space, until even that was outgrown. Therefore towards the end of 1989 the business was relocated and took over the second floor of a converted church nearer the center of Los Gatos, and this is where it would remain until it was essentially closed in 2006 due to Marian's poor health. Taking the business out of the home paid off and annual sales grew tenfold to exceed $1 million by 1994. Perhaps there wasn't a single item that caused the growth, other than Marian's adventurous spirit. Moving the product line more and more into haute-couture and adding cut-velvet fabric were major factors. Using triangle scarves sewn on the bias Marian also developed a styling that conformed the garment to the wearer's body which made her gowns both elegant and slimming. The company also expanded its offerings. Over the same period the number of styles offered per season was doubled, and the company was creating a collection for up to 5 seasons a year. Another important factor was the appointment of very capable sales representatives; “ADK Fashions” in New York and “Rep et Trois” in Los Angeles. Later ADK would be even more significant by capturing business from major US chain stores such as Neiman-Marcus, Saks Fifth Avenue, and Nordstroms. This would provide the growth for the last half of the 1990s so that sales would eventually peak over $2.5 million. Unfortunately business softened at the turn of the century. Firstly due to cheap imitations of Marian's long pile cut-velvets using short pile velvet burn-out (devor�) fabric from China. Although the look and the feel of these two fabrics were different, and recognizable to any textile person, even some garment buyers weren't sure of the difference. Not surprisingly the cheap burn-out at one quarter the price per yard soon flooded the market. This was followed by the nervousness that impacted spending due to the 9/11 disaster in New York. Eventually Marian's poor health forced the closure of the business. Back in 1994, while participating in Fashion Coterie at the Plaza Hotel in New York, Marian suffered a stroke. The cause was a bleed in her brain and a couple of days later she was in coma. Limited surgery stopped the bleeding and, although the cause was never exactly defined, after some weeks of rehabilitation she recovered and was functioning reasonably close to normal a few months later. 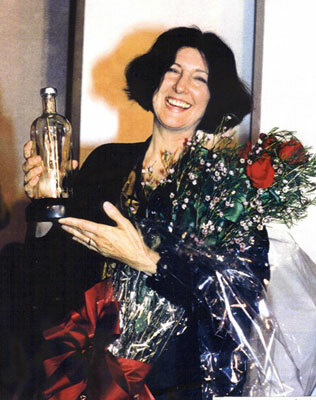 In fact the following year, 1995, she won the Golden Shears Award as best fashion designer in San Francisco. Then, as mentioned, the business grew dramatically. Sadly the problem, which turned out to be a brain tumor, returned 11 years later in 2005. Surgery was successful in removing it, but the subsequent radiation therapy burned her brain badly and slowly she weakened, until by 2008 she was confined to a wheelchair. Although dyeing and printing were always key elements in the fabrics that went into the garments, as the business expanded Marian's creativity looked at other opportunities for embellishment. In particular she used fringes, trims, and passementerie to decorate many garments, and air-brushing light sprays of color - particularly gold - added subtle texture to some looks. She clearly had gone beyond typical art-to-wear, but her styling still had a noticeable arty element to it which was probably the reason she acquired the title of “Queen of Bohemian Chic”. Her excitement with new materials continually made her garments unique. This uniqueness even drove her to request major European weavers and printers to provide custom designs. She had been buying house designs of cut-velvet for a few years from Brochier and SETB in Lyon, France. Then she decided that her look needed her own designs and fortunately the mills were willing to work with her. And the same happened with the quality Italian printer, Ratti. First she bought their house designs and then had them print her own. Having lived in four countries and travelled around the world, Marian's trail-blazing textiles embodied a global sensibility. She drew inspiration from Kabuki, grand opera and modern dance, as well as from the traditional garments and textiles of many countries. As she often travelled around Europe looking for unique textiles, in 1992 she was invited by Aid to Artisans to work alongside Hungarian felt-makers and give them ideas for possibly expanding the market for their products into international fashion. Among the results Marian designed a series of waistcoats using Hungarian felt, followed by an inventive group of accessories. Marian would later take time to provide similar support to artisans in India. By 1998, and again in 1999, she presented her collections at the prestigious “7th on 6th” catwalk shows held in New York City during Fashion Week. At once bold and subtle, glamorous and experimental, her garments were predominantly for evening or special occasions so not surprisingly they often appeared worn by the rich and famous. Some of the most fascinating and accomplished women of our time - Cher, Diana Ross, Kirstie Alley, Bridget Fonda, Barbra Streisand, Patti LaBelle, Lisa-Marie Presley, Edna O'Brien, Phylicia Rashad, Meryl Streep, Elizabeth Taylor, Sigourney Weaver, Catherine Zeta-Jones - the list is long. They even dressed leading ladies in major movies - Meryl Steep in “She-Devil” and Whitney Houston in “Bodyguard”.